How long it takes for your fruit to become plump and soft has to do with how dry it is. The current season’s dried fruits usually cook more quickly than fruits you’ve had sitting around for a year or more, but eventually, they too will revive, soften, and plump up. 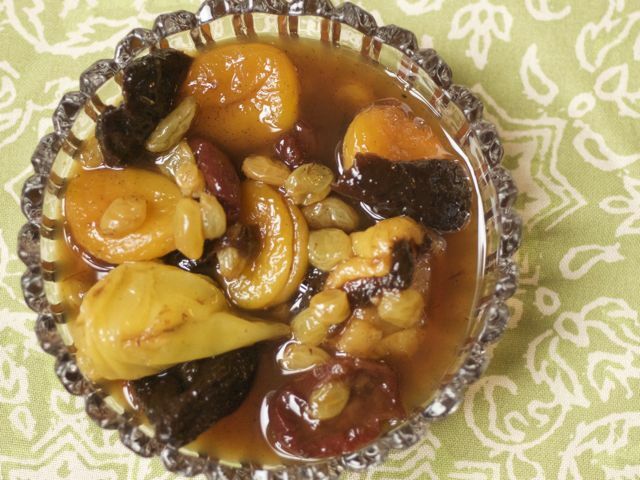 2 to 3 cups dried fruit, such as pears, nectarines, peaches, apricots, cherries, pluots, raisins, etc. Combine 3 cups water and the honey or sugar in a saucepan large enough to hold the fruit. Bring to a boil and stir to dissolve the sugar if using. Scrape the seeds of the vanilla bean into the syrup, then add the pods. Add the fruit, reduce the heat to low, and cook, covered, until soft, about 20 minutes, or longer, if necessary. When the fruit is tender, remove it with a spoon to a bowl, leaving any pieces that need more cooking to simmer until done. Return the cooking liquid to the heat and simmer until syrupy and covered with bubbles, about five minutes, then pour it over the fruit. Serve chilled. Variations: Replace half the water with a sweet white wine, such as a Riesling. (Red wines are good too, but they obscure the colors of the fruit.) Add a cinnamon stick, 2 cloves, cardamom seeds, toasted peppercorns, and the like to the liquid as the fruit is poaching.